FYI - We've recently updated some of our contact lens prices. We've stayed comparable to other retailers, so make sure to use your manufacturers rebates for the best possible savings! 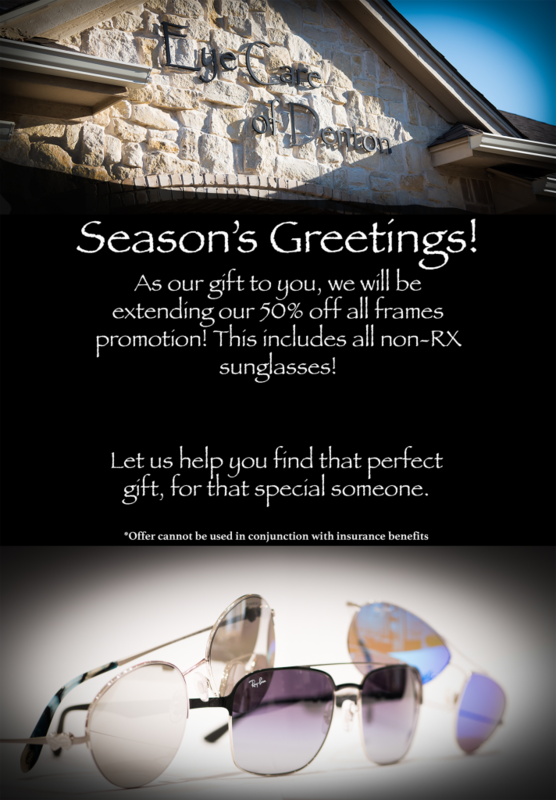 We're bringing back our 50% off ALL FRAMES sale through the end of the year! 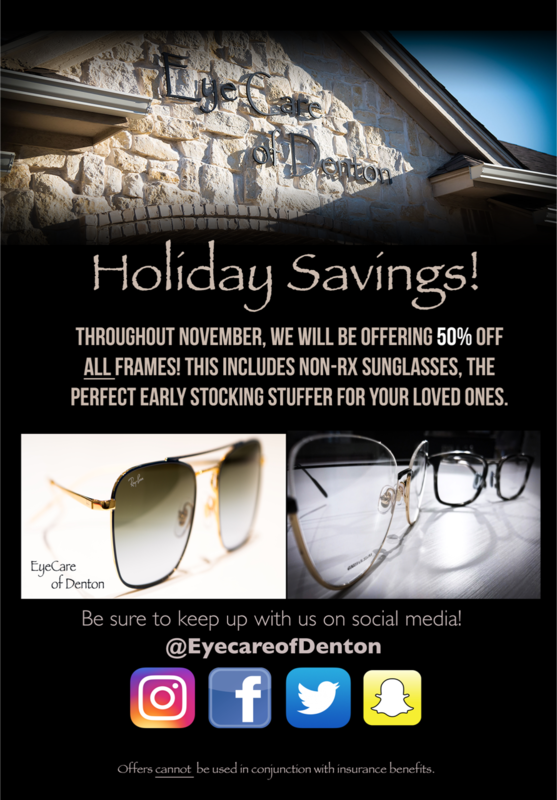 Sale includes designer frames, sunglasses, and non-prescription reading glasses. Promotion is not limited to one pair, and can be used to purchase gifts for your loved ones as well! *Offer cannot be combined with insurance benefits* Remember that you can use your flex spending account or health savings account on our services, glasses or contact lenses before the year ends. ATTN Acuvue contact lens wearers: selected lots of Acuvue brand contact lenses have been voluntarily RECALLED. The following prescriptions are involved: Acuvue Oasys for Astigmatism: -6.00-1.75x170Acuvue Oasys for Astigmatism: -3.50-0.75x180Acuvue 1 Day Moist for Astigmatism: -7.50-1.25x180 Full details and how to check if your contacts are affected are available at https://www.acuvue.com/sites/acuvue_us/files/acuvuerecall_us.pdf. Call our office at 940-891-0484 if you have any questions. 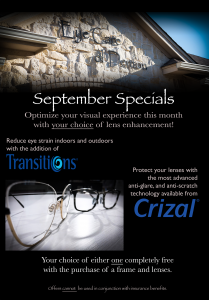 We will be continuing October's special until November 22nd: FREE Crizal Avance No-Glare coating when a full set of frames and lenses are purchased. Our September back to school sale is for everyone, even if you aren't headed back to school! 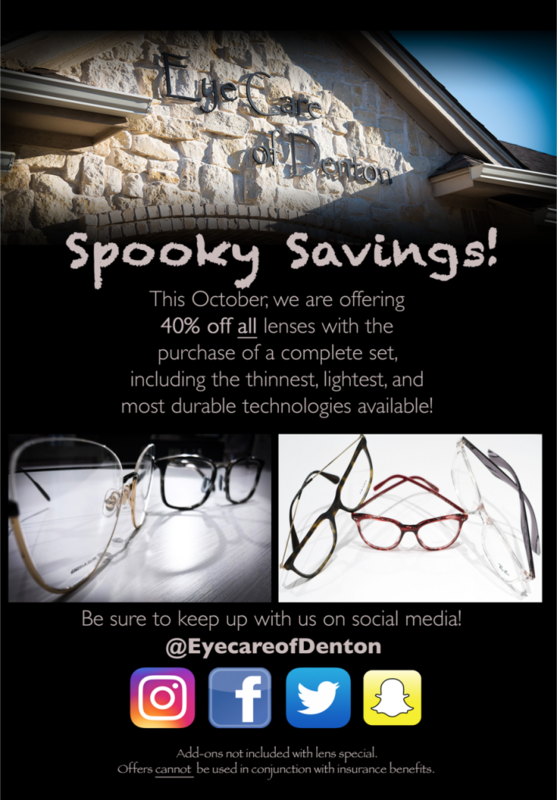 Sale includes designer frames, sunglasses, children's frames and non-prescription reading glasses... Any frame! 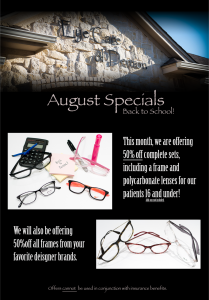 Since we've had such an overwhelming response to our July frame sale, we will be continuing this sale through the ENTIRE month of August! 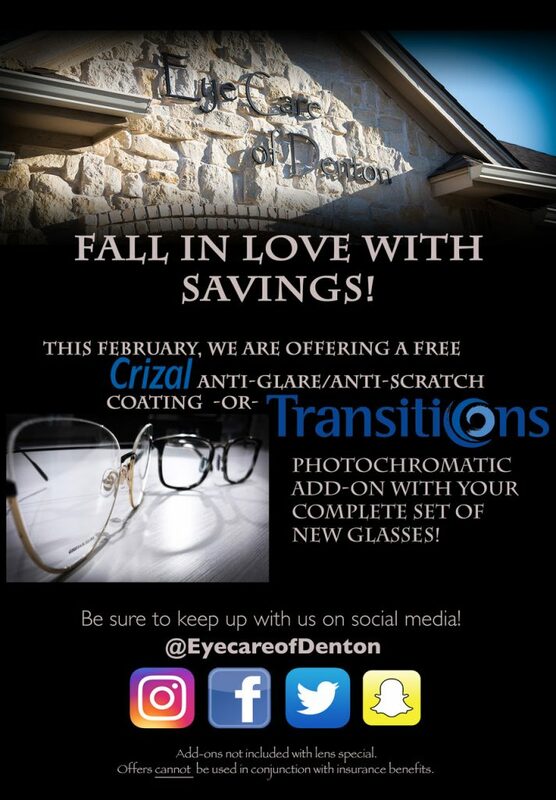 Come by and browse around our new optical if you haven't already and take advantage of this great deal for another month! "Although this voluntary recall represents low risk to the consumer and is unlikely to cause serious health consequences, the company is voluntarily recalling the product...Testing showed occasional occurrences where the residual peroxide remaining in the lens case after neutralization was out of product specification. 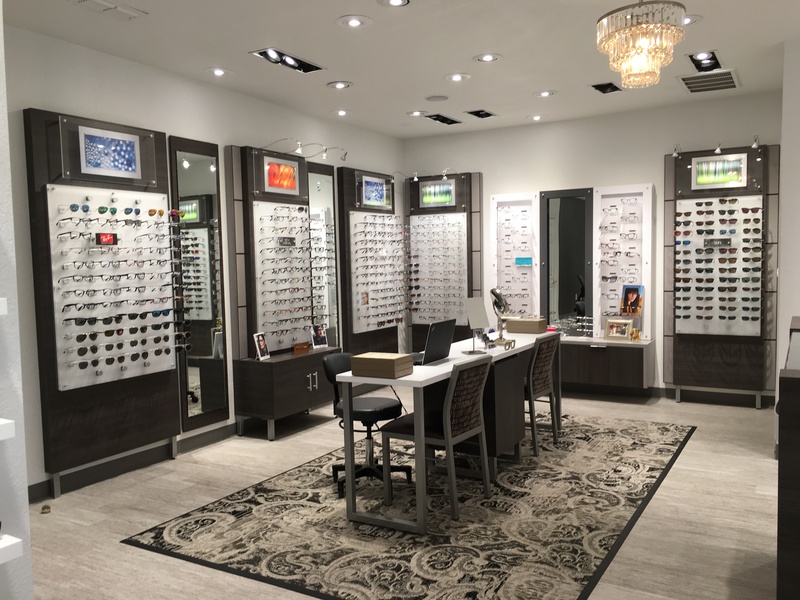 Our opticians have been busy meeting with vendors this summer to keep our selection of fashionable frames up to date and well stocked - take a peak on Facebook! Also, stay posted for more info about our next trunk show Oct 8th featuring Ray-Ban and Coach! Don’t rely on vision screenings alone to evaluate children’s eyes and vision. A child can pass a screening and still have vision problems that interfere with learning. Children often do not know they aren't seeing "normally" since they don't have anything else to compare to. During a comprehensive eye examination at our office, we test eye coordination, alignment, ability to focus, and eye health. These issues are easily overlooked during a vision screening, which leaves some children having issues with depth perception, eyestrain from reading or looking up close for long periods of time, and retinal issues. Children and adults alike are all are using more devices - and we want to make sure everyone's eyes are working well as a team so you can be comfortable learning, working, and simply enjoying all your gadgets! We are very excited about our new Tiffany and Co. glasses that we will be adding to our optical. In celebration, we will be putting on a trunk show from 3 pm to 7 pm on June 4th - and our vendor will have the entire line of frames and sunglasses on display. Bring your friends and family to take a look, try them on, and enjoy some appetizers while you're here! 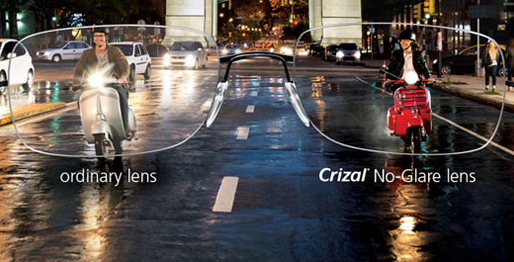 In addition, we will also have the new Define 1 day eye enhancing contact lenses available to try. We'll let you know if your prescription makes you a good candidate for the lens if you've had an exam here in the last year. If not, we'll estimate of the contacts you'll need - and if you like them, feel free to schedule your contact lens appointment for an accurate prescription. Lastly, if you haven't had a retina check in a while - we will be offering 1/2 priced Optomap photo screenings the entire day on June 4th. So come drop by and spread the word - we hope to see you there! 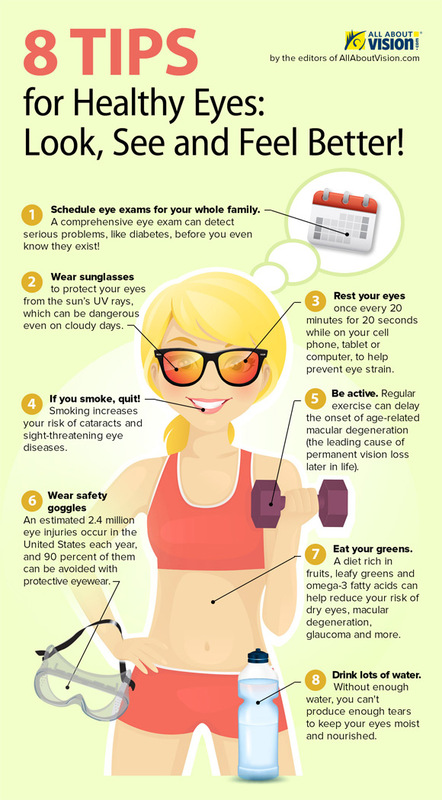 Don't forget to wear your UV protection this summer! Come in and browse through our selection of sunglasses if you don't already have a pair. Our optical gallery got a new facelift this week, just in time for our end of year promotions! We have select childrens frames for $140 and under (ask us about additional specials available if you are cash pay/not using insurance). We also have select Fendi's on sale for 25% off original price. Remember that you can use your flex spending account or health savings account on our services, glasses or contact lenses before the year ends. We welcome you to come by and browse through our frames and new gallery look! We've been having technical difficulties - Sorry if you've had a hard time contacting our office the past couple of days. While our trees were getting a trimming yesterday, our phone lines accidentally did too! Everything is back in order now, so if you haven't heard back, try us again please! Thanks for your patience. Starting September, we will be open 6 days a week for your convenience - Monday through Saturday! Please go to our Hours & Locations page for more details. From now until September 3rd, we are having a sale - take 20% off our sunglasses including Coach, Prada, and many more! Come in and find your perfect pair to enjoy the rest of the hot and sunny Texas summer with! **Sale excludes Maui Jims and Clips.